In addition to a previous article on How to add a primary key to an existing table in MySQL, I tried the same in Oracle as since version 12c this feature is also supported. COL2 is automatically filled with a unique sequence id number. Note: Bear in mind that adding this kind of primary key to a huge table can take a considerable amount of time. We ran into unpublished bug 18744247 – ORA-30667 ON DROPPING COLUMN WITH ‘DEFAULT ON NULL’ ATTRIBUTE. The problem has something to do with the fact that the auto increment column is not available in the dictionary tables. When trying to reproduce on one of our Oracle database on docker with same version 12.1.0.2, but with a different PSU level, the problem didn’t occur. So if you will run into this problem really depends on your database version. The problem should be solved in Oracle 12.2 but interim patches are available for databases with recent PSU updates installed. One of my colleague sysadmins wanted to set up replication for his WordPress hosting databases. Some of his customers were using rather old WP plug-ins using tables that actually didn’t have a Primary Key (PK) defined on it. And since having (a sort of) PK is one of the first requirements for setting up replication he asked me how to solve this in an easy way. Bear in mind that executing this action on a huge table can take a long time so first run this action on a test environment to determine the execution time. Adding a PK with auto increment in Oracle is described in Add primary key to existing table in Oracle. Now that the OMS has been moved and configured there is one thing left: Making sure all agents are pointing the the new OMS. The targets from the central agent on the monitoring server itself need to be moved to the new management agent on the new server. Re-secure all agents on all nodes. emctl secure agent -emdWalletSrcUrl "https://<new server>:4903/em"
Next step is to relocate the oracle_emrep target to the new OMS host. This part failed in a previous step because the old OMS was not running at the time. So, on the old OMS, start the management agent before continuing with the next step. emctl secure agent -emdWalletSrcUrl "http://oramon.isd.org:4890/em"
Error: Already logged in as user "sysman". Use "emcli logout" to logout the current user. Now check on the old server if the are still any Weblogic targets left that should be present on the new server. Be sure to select “Unblock agent on successful completion of agent resynchronization”. The next step is probably unsupported and perhaps not necessary for your configuration, but it fixed our last issues! From this point our Enterprise Manager 12c installation is now completely configured and running on our new monitoring server. As we did more Enterprise Manager (re)-installations in the past, this time we opted for a complete move of the repository database and OMS to a new server. In this way we’re able to keep all history and was it not necessary to do any new configuration on all monitored servers. Both repository database (11.2.0.3) and OMS are located on 1 dedicated server. Both resources we’re helpful but we had to do some more configuration steps to get a 100% result to move our version of Enterprise Manager Cloud Control 12c ( 12.1.0.2.0 ) to a new server. On the new server, install OMS Software only. Successfully installed the software binaries. We did not run this command, because there is nothing to configure yet. Now we need to know what patches and plug-ins were already installed on the old OMS. These patches can be installed according the patch installation notes. Download ALL these plugins and place them in a new folder on the new server. Rename downloaded plug-in *.zip files to *.par files. In our case the software library is on a shared location, so no need to copy or configure, everything stays the same. 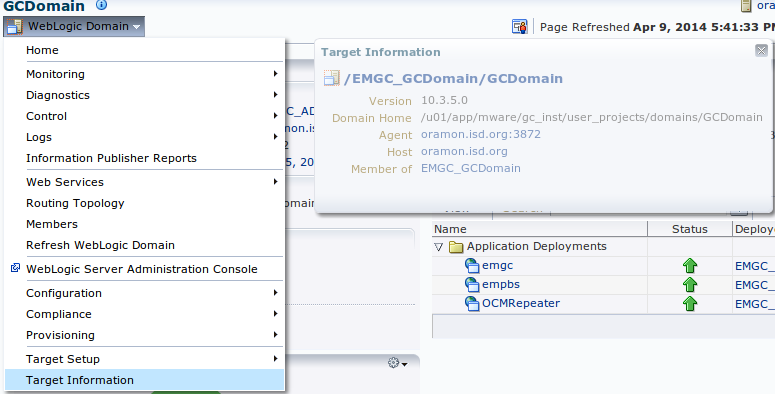 We are recreating/configuring the new OMS by importing the backup from the old OMS into the new OMS. On the old OMS server, stop oms and agent and make a backup. Copyright (c) 1996, 2012, Oracle. All rights reserved. Post “Deploy and Repos Setup” operations completed successfully. Performing Post deploy operations …. Total 0 errors, 77 warnings. 0 entities imported. No errors in the omsca_err.txt, all seems fine. 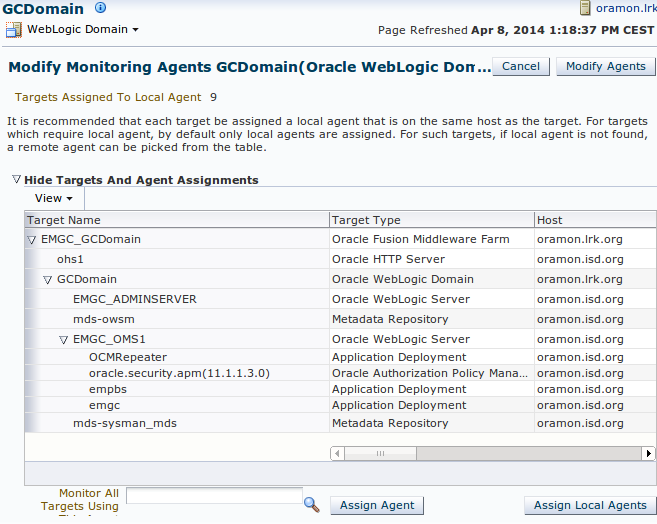 The last part of the configuration is about relocating agent targets, including the central management agent, which will be explained in part 2.